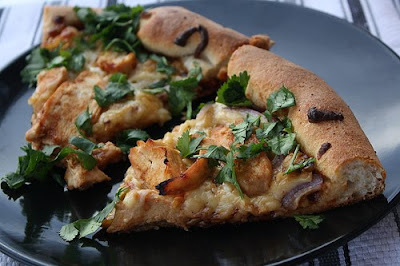 Discription:This California chicken pizza mixes chicken, bqq sauce, and a couple cheeses. The highly of this recipe is the smoked gouda cheese. It really adds a nice smoked flavor to compliment the bbq sauce. Another great ingredient in this recipe is sliced red onions, which go perfect with bbq chicken. If you want to make sure the crust doesn’t become soggy, you can prebake the crust, or at least bake it for a little bit. If you are looking for a delicious pizza recipe, give this one a try. Enjoy. Step 1: Pre-heat the oven to 500 degrees (for premade or box mix crust- set oven temp according to package directions). Coat chicken slices with 2 tablespoons of bbq sauce. Set aside. Prepare pizza crust and roll out onto a pizza pan. Step 2: Spread ½ cup bbq sauce over the pizza crust in an even layer. Spread cheese over the sauce. Spread chicken over the cheese and top with sliced onions. Step 3: Place into a preheated oven and bake until the crust is crispy and the cheese is bubbling.